Nasir has been posting photos to his facebook page from the little peaceful protest he covered in the morning. He noticed his location settings for Facebook was turned on. Anyone can see where he is currently and keep track of his movements. The Geo tagging feature is, an awesome way of letting people know where you had that delightful lunch with your family, or the beautiful view from your room during a holiday trip. It just makes it easier for you to arrange photos and let friends know where they might be able to replicate some enjoyable experience you had. With its interesting capabilities, there is also risk to consider when using the Geo tag feature. The primary risk with geo tag is the risk of “social surveillance.” If you’ve any social media platform, be it Facebook? Twitter or Instagram. You must have come across social stalkers. These modern creepers make use of the information you publish on social media pages in order to track your movement, your habits, and your associations. Stalkers can make use of public geo tagging information to pinpoint your present location, find out where you live, and even how and where you spend your time with very little effort. The follow points are best ways to keep you safe while geo tagging. Take the time to note your default privacy settings: This applies both to your smart phone or mobile device and the social media networks you access through your device. Sometimes tagging a location maybe a default setting on your phone or on the social network you’re using. It is important to be aware of these settings so you can consciously decide when and where you geo tag, and who the information will be available to. Understand the Risk: Realize that geo tagging information gives anyone who views it the opportunity to know your exact whereabouts, particularly in instances where you’ve posted your location to multiple sites (e.g. Twitter, Facebook, and Instagram). A check-in at the airport with the message “vacation for the next week!” for example lets anyone who might care to look know that you’ll be out of town for a week. Go to the “settings” page of the geo-tagging program. 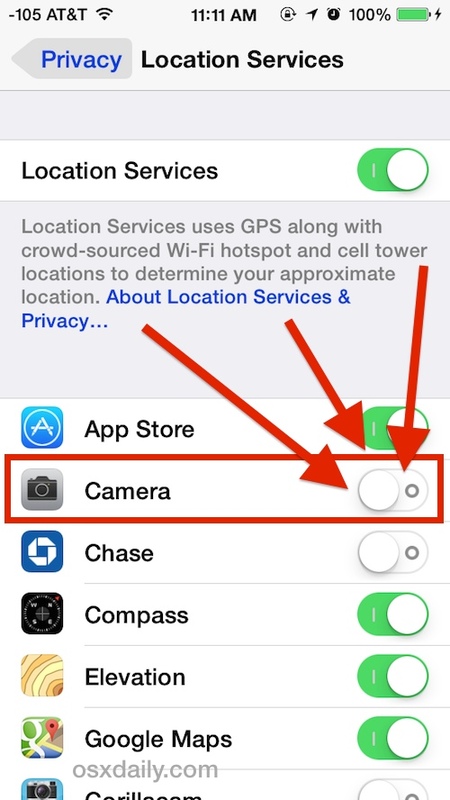 Go to “settings” then “general” and then “location services.” Disable those applications that automatically make use of your GPS tracking data. Start the camera application. Open the menu and go to “settings.” Turn off “geo tagging” or “location storage” (depending on the type of Android). For digital cameras, be sure to consult the user manual. Not all digital cameras come with a geo tagging feature, but it’s important you know how your particular camera operates in relation to location tracking. The Geo-tagging feature of your mobile devices may constitute a surveillance risk and except you expressly want your location to be known by someone, it is advised that you turn if off via your device settings.